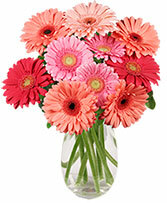 Celebrity Vase, Foliage: Pittosporum, Gerberas In Assorted Colors (Shown: Red, Pink, Peach & Salmon). Yellow Ceramic Rose Pot, Wet Floral Foam, Foliage: Galax, Ming Fern, Orange Rose, Yellow Gerbera, Green Novelty Poms, Orange Carnations, Solidago, Green Hypericum. When you can't leave happiness to chance, hit it big with this sure-fire bet! 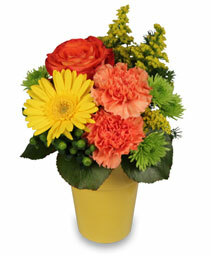 With yellow gerberas, orange roses and carnations overflowing from a yellow pot, this flower arrangement hits the jackpot. Celebrate success and say, "You're a Winner!" with this grand prize. Sweetest Day is like a mix between Valentines Day and Thanksgiving. It’s a day to give thanks for those extra-sweet people in your life. The holiday originated with a candy store owner who wanted to bring cheer and some happiness to the lives of those who were often forgotten. A great way to celebrate Sweetest Day is by ordering a gift basket of sweet treats from WHIDDEN FLORIST for your someone sweet.